What is a Puff Pastry? Puff pastry, also known as Pâte Feuilletée or feuilletage in French, is a very delicate and rich pastry that consists of many thin alternating layers of dough and fat. 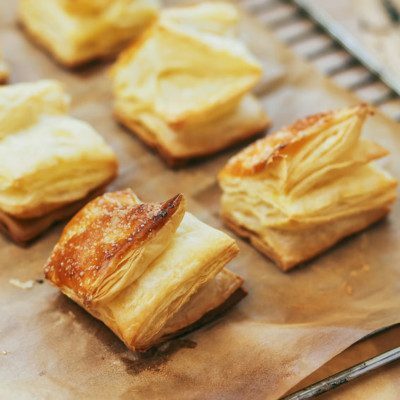 This lamination is what gives puff pastry its light, crispy and flaky texture upon baking. Products such as croissant, Danish pastry, strudel, creme, torte cakes are often grouped under puff pastry, However, since croissant and Danish pastry are yeast-leavened, there is a tendency to exclude them from the puff pastry category.1 Many newer variations also include flavored/colored doughs such as chocolate to add to its visual appeal and taste. How is puff pastry made? While not included under the category of viennoiserie, puff pastry is traditionally processed in a similar manner with some modifications to improve or shorten the process. Making puff pastry involves preparing a water-based dough, referred to as the detrempe which is flattened to enclose a block of butter (beurrage) within it. The dough/butter assembly is repeatedly sheeted out and folded to form alternating layers of dough and fat. Single, double folds or their combinations can be formed with a minimum of at least four single folds and up to a maximum of six. Blitz puff pastry: “Blitz” is a German word for “lightning,” a reference to the speed of the lamination process. Using this method, the fat is distributed throughout the dough non-uniformly in the form of small discs. Upon baking, Blitz pastry dough does not rise sufficiently which limits its utilization to cream fillings and other less refined applications. Traditional puff pastry: the butter block is sandwiched between two layers of dough and then laminated. This process requires a fairly long processing time. Italian puff pastry: also known as pasta sfogliata. This pastry dough contains white wine and eggs and requires intensive mixing prior to lamination using the traditional method. Inverted puff pastry: as the name suggests, the layers of dough and fat are reversed in this pastry dough. A reversible dough sheeter is required for this process. Baking results in a crispy and flaky product as the layers of fat become one during lamination. Although this process is fairly difficult, the pastry dough does not shrink, therefore, eliminates the need for final rest as in other methods. *Butter for lamination is a percent of the total dough weight. Mixing for 4-5 minutes until all ingredients are well incorporated. Full development of gluten occurs during the lamination process. Resting of the dough for about 1 hour. Laminating into 5-6 single folds, two folds at a time followed by a 30 minutes of rest between each folding set. Once the desired number of layers has been achieved, the dough is then sheeted down to around 0.6-0.8 inches to be baked or packaged. Puff pastry can be prepared fresh or obtained as a ready-made chilled or frozen mass. Commercially, large-scale pastry dough manufacture can be made in batches or using continuous production lines. The pastry sheet containing the fat is rolled out and by transversal unfolding is reloaded from one belt to another of lower speed. A sheet of up to 128 layers of fat and dough can be obtained which is then cut, filled, shaped and brushed prior to packaging. Lamination thickness: The layers must be sheeted to an even thickness to ensure even rise during baking. Production temperature: A low temperature (10–20°C) must be maintained in the plant to prevent the roll-in fat from melting or from becoming too hard to sheet well. Melting point: The butter or fat must always have an adequate melting point and plasticity to ensure smooth running of the line. Traditionally, flour is mixed with the roll-in butter and set in a refrigerator prior to lamination to increase the dough’s plasticity and to keep it from melting. Baking: Producing a crisp and flaky final product requires baking in a convection oven at 176°C for various durations depending on the product. Cauvain, S. and Young, L. Baking Problems Solved, 2001. Woodhead Publishing Series in Food Science, Technology and Nutrition. pp 280. Suas, M. “Viennoiserie” Advanced Bread and Pastry: A Professional Approach, first printing, Delmar, Cengage Learning, 2009, pp. 331–346. Suas, M. “Advanced Dough Technology and Dough Conditioners” Advanced Bread and Pastry: A Professional Approach, first printing, Delmar, Cengage Learning, 2009, pp.127–160.5. Gisslen, W. “Pastry Basics” Professional Baking, 7th edition, John Wiley & Sons, Inc., Hoboken, New Jersey, 2017, pp. 315–351. what are ideal characteristics of the wheat flour that is best suited for puff pastry. how is it different bakery flour used to make bread and buns? Pastry Flour would be the most appropriate. The difference lays on the Protein amount in between different flours. I invite you to download our Flour Science in 5 Minutes free e-book.